← Chrism Eucharist in Cork, Cloyne and Ross – the photos! Good Friday liturgies are stark. They are marked by solemn silence, the retelling of the journey of Jesus to the cross of his execution, and the cross is proclaimed. Details of Good Friday Services from around the Church of Ireland Diocese of Cork, Cloyne and Ross may be found in this earlier report here. 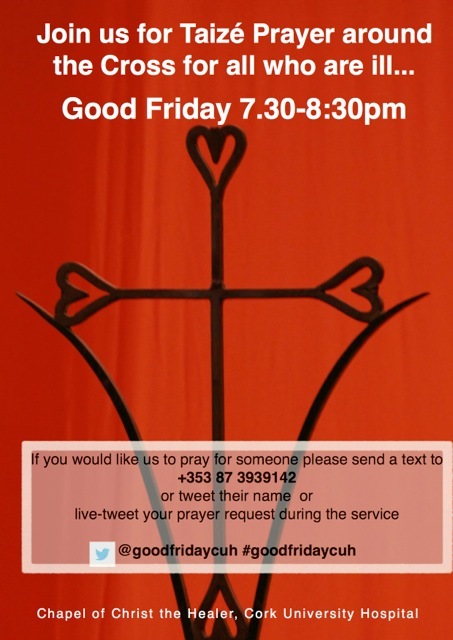 The Church of Ireland Chaplaincy at Cork University Hospital, led by Canon Daniel Nuzum, makes special provision this year once again, to include people at a distance or those on social media in their Good Friday Taizé Prayer around the Cross. On Good Friday from 7:30pm there will be an ecumenical ‘Service of Prayer around the Cross’ in the Chapel of Christ the Healer at Cork University Hospital. In addition to being broadcast on Hospital Radio CUH102FM this year there will be an open invitation for people outside the hospital to share in this prayer through social media and SMS text. The suffering of Christ on the Cross has a particular poignancy when we struggle with illness and disease and so in a special way we as hospital chaplains wish to pray for and uphold all who carry the cross of illness and pain this Good Friday. Sharing this service through social media helps us to extend the embrace that God offers to all, especially in our brokenness. During the service you are invited to tweet, or text the name of someone you would like us to pray for those present in the chapel will include them in the prayers offered here. This entry was posted in Church in Society, Church Services, Diocese, Holy Week, Pastoral, People in Need, Prayers, Special Events. Bookmark the permalink.